Frankl opened his presentation by providing an introduction to activism and M&A Solutions. He explained that FTI Consulting offers advisory services to shareholder activists and hostile M&A situations in a bundled manner, which differentiates FTI from classic advisor groups and new entrants. "This unique combination of expertise enables our team to help bolster the traditional legal, banking, and PR advisory services of both corporations and activists." Frankl discussed the different aspects of shareholder activism such as economic activism and social issue focused activism. Economic activism can deal with management/board replacement, capital allocations (share buybacks), and M&A sell-offs, spin-offs, and restructuring. Typical shareholder types include hedge funds, mutual funds, and individuals. Social issue focused activism can deal with environmental, social and government issues such as the adoption of a climate change policy or disclosure of corporate political contributions. In this instance, typical shareholder types include mutual funds, public pension funds, labor-affiliated pension funds, social, religious and policy-oriented groups, and individuals. Frankl provided examples of notable shareholder activism and pointed out the increase of shareholder proposals. He also explained the building blocks of good corporate relations with shareholder activists: 1. be prepared; 2. promote good shareholder relations with institutions and individual shareholders; 3. inform, teach and consult with the board; 4. maintain transparent disclosure practices; 5. educate third parties; 6. Communicate with the activist; 7. understand the role of litigation; 8. factor in contingencies and options; 9. Understand the role of regulators. 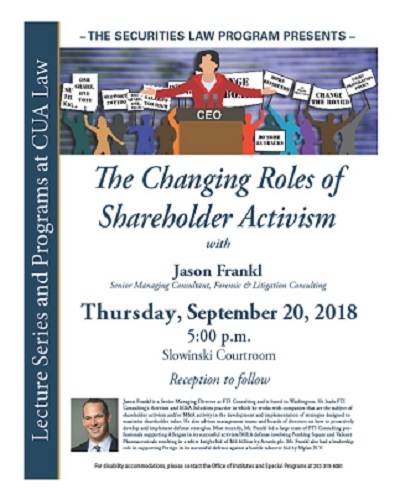 Frankle, Jason, "The Changing Roles of Shareholder Activism" (2018). Securities Law Program Lecture Series. 22.